This is a Pet Resort in Newport, Vermont. This installation occurred in the summer of 2002, and includes a cozy heated slab for the comfort of canine visitors and a snowmelt outside the main entryway. The snowmelt not only eliminates shoveling of a high traffic area, but enables the owners to keep the walkway safe, dry, and ice free without irritating chemicals or salt tracking into the building. Starting the Pour: Note that it’s okay to walk on the tubing. Just be careful with sharp tools. Manifold in place, ready for the pour: Note that this is the box in which the manifold is shipped. Pieces of scrap EPS foam (blue board) are stuffed around the tubing to keep the concrete from entering the box and actually touching the copper manifold. The pressure test kit is built into the manifold. 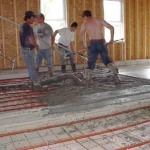 The Manifold After The Pour: When the box is broken away, a ‘manifold well’ has been created. This well keeps the connections visible and accessible, but safe from damage during future construction. If the tubing were sticking up out of the slab, the chances of harm coming to the exposed PEX pipe are much greater. Notice also how the pressure test kit bridges the supply and return side of the manifold. This temporarily creates a closed loop, allowing the system to be pressurized. 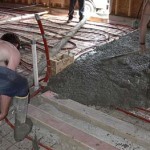 When the manifold is ready for final connection to the heating system, the test kit is either cut off or unsweated, leaving only the two vertical supply and return pipes sticking up above slab level. Snowmelt on walkway in front of kennel. A wider view of the snow melt: In the winter, hundreds of animals will walk across this slab, pulling their owners behind them. When it comes to safety and cleanliness, an entryway free of snow and ice is more than just a luxury. The kennel uses a four Zone radiant system: powered by a 199,000 BTU/hr. Polaris high efficiency water/space heater.